The Crown Hotel01328 710209work Small HotelThe Crown Hotel - the perfect place to retreat, relax and refresh in beautiful north Norfolk. Big blue skies, sandy beaches stretching away into eternity, desolate salt marshes rich in wildlife, picturesque villages and quaint seaside resorts - north Norfolk is the undoubted jewel in East Anglia's glittering crown. And if you're looking to experience the natural wonders offered by the north coast of one of England's remotest counties, you need cast your eyes no further than the Crown Hotel. A former coaching inn, the hotel is tucked away on the edge of a tranquil tree lined green in the fishing port of Wells-next-the-Sea. Recently refurbished to enhance its existing historic features, whilst still retaining a warm and welcoming ambience, The Crown has 17 luxury en-suite bedrooms. Each is equipped with a flat screen TV and DVD player and uniquely and individually decorated to create a warm and welcoming home from home atmosphere. The hotel has two family suites with separate children's room and in some rooms you can even have your dog stay. Downstairs, guests and diners can select from a from a sumptuous and varied menu which makes superb use of the finest and freshest seasonal produce, courtesy of the hotel's proprietor, New Zealand-born chef Chris Coubrough and his kitchen team. Whether you choose to eat in The Crown's front restaurant, the spacious orangery of one of our two lounge rooms, you're sure of a culinary experience that will linger long on the tongue and even longer in the memory. 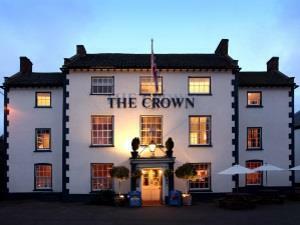 The Crown Hotel - the perfect place to retreat, relax and refresh in beautiful north Norfolk. From Fakenham take the B1105. It is 9 miles into Wells-next-the-Sea. King's Lynn station change to Sheringham which is 17 miles away. Norwich is 34 miles away.